Lilaceae - lily family Monocot. 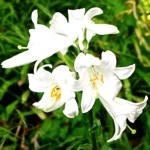 The white lily, Lilium candicum, was possibly the first flower ever to be taken from the wild and cultivated in gardens. It were valued highly by the Minoans 3,500 years ago, who considered it to be symbols of power; perhaps it was the Minoan Prince Staphylos who first brought lilies to Skopelos. Images of the flowers, have been found in a Minoan villa at Amnisos in Crete and in the throne hall of Knossos palace. Together with red lilies, L. chalcedonicum, which also grow wild in Greece, they decorated the walls of a wedding chamber at Akritiri in Santorini, where they represent purity growing into adulthood 1. They were sacred to Ariadne, daughter of King Minas and wife to Dionysos and mother of Staphylos 1. Later in ancient Greece the white lily with its dual symbolism of purity and fertility, was dedicated to Hera the wife of Zeus, queen of heaven, goddess of marriage and protector of women in childbirth. The Byzantine church considered the lily to be the simple flower of paradise and it was often grown in monastery gardens. As the centuries went by it became associated with the Virgin Mary and in particular with the annunciation, when the angel Gabriel told Mary she was to bear the holy child and was it given the name madonna lily. The sight of these beautiful pure white lilies, with golden yellow stamens and exotic perfume, growing tall in the shade of the trees inspires peace and tranquility; it is not surprising that they achieved religious symbolism in successive civilisations. 1. Riklef & Ullrich; Symbolism of plants: examples from European-Mediterranean culture presented with biology and history of art: June: Lilies, Journal of Experimental Botany, 2009. The white lily was sacred to Hera; she was a jealous wife and her husband Zeus had fathered Heracles to a mortal woman, Alceme,. As he wanted the boy to become divine, he drugged Hera so that the baby could suckle her milk, endowing him with great strength and power. On waking to find the child at her breast, Hera cast him off; the milk was splashed across the heavens creating the milky way and a few drops fell to earth: Where they landed white lilies grew. Angry that the pure whiteness of the flowers was the result of Zeus’s infidelity, she adorned the lily with a long protruding stigma, as a symbol of masculine treachery.